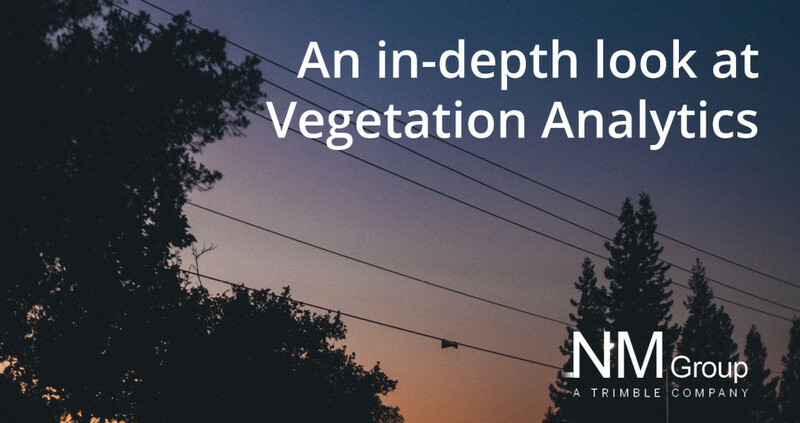 Vegetation risk to overhead power lines is a perennial issue for electricity networks. The flashover of electricity from wires to vegetation or as a consequence of tree-fall can result in mechanical damage, electrical faults and sustained outages. These issues cause expensive repairs and a decrease in network reliability, even resulting in financial penalties. The current Business as Usual (BAU) approach for Vegetation Management using geospatial data is to conduct compliance reporting. This uses the specific locations of vegetation and wires at the time the data is captured. Our new approach extends existing science in forestry and vegetation hazard management to use predictive modeling, machine learning and new technologies, objectively reducing spend while increasing resilience. NM Group, in collaboration with an academic Knowledge Transfer Partnership (KTP) with Durham University, created a new technology approach to avoiding outages through better identification and prioritization of vegetation risk to power networks. We call this Vegetation Analytics. The limitations of the current BAU approach is that although high quality, accurate geospatial data is incredibly valuable, there is often a gap between the data and the ability to use this data effectively. This is due to a number of reasons. If the data is just using a snapshot in time and decisions are made purely on the proximity of trees to wires, there is a plethora of more advanced analysis that are being ignored. Take the example of tree fall risk. A potential hazard tree is any tree that if it fell would touch the line. However, for a distribution utility that may have large exposure to vegetation due to its network size this might number hundreds of thousands of trees. In addition, they are often on private or subject to environmental restrictions land and so cannot be cut back or removed without good cause. This calls for a more objective measure of risk identification in order to inform where resources are best deployed. Another way BAU approaches fall short is they typically ignore previous datasets, geospatial or otherwise. Historical information can tell you a lot about what happened and why, in order to make new, accurate predictions. By looking at the data more holistically, operators can exploit some key advantages. So what to do? 1) Inventory - enables the identification of exactly which spans have trees, how many and how close they are to the line. It also helps define the best course of management, i.e. if there are many high-risk trees then removal is likely to be more cost effective than pruning and vice versa. This enables more cost effective maintenance cycles. 2) Growth rates - providing utility specific measurements of vegetation growth rates to optimize (and often lengthen) cutting cycles as necessary. Thereby reducing the cost of patrols and cutting with no increased risk exposure. 3) Tree fall risk -by identifying trees that are most at risk of falling into the line and causing an outage. Tree fall analysis using LiDAR has traditionally highlighted any tree that is ‘geometrically close enough to fall’ as a risk. Our approach extracts much more value from the LiDAR dataset to model local topographic, meteorological and vegetation structural factors that contribute to tree failure and extrapolates this to any potential threat. This allows for identification of trees more at risk of failure, modeling the local and environmental patterns and historic tree fall events. This technology has already been applied to a network in Australia on a wide-scale trial of 12,000 km in NSW. Working with DNO Endeavor Energy, our team were able to inventory the trees on the network, model growth patterns per span and risk-rank trees based on their match to local fall patterns. Quantitative testing of this tree-fall model on historical tree failure indicated an 80% success rate in the model’s prediction ability. Other benefits came in helping Endeavor to select the most cost effective management option. For example in clearly identifying which spans should be pruned versus cutting down vegetation. This has greatly helped in reducing contractor costs through better-defined work packages. Our client has seen this project as being an important part of their drive to reduce vegetation management OPEX and move towards a risk-based approach to vegetation management. Better targeting scarce resources in the face of strong regulatory pressure to cut costs.